Floorcloth paintings may be thought of as paintings on canvas that lie on the floor instead of hanging on the wall. Being placed on the floor subjects the painting surface to abrasion and dirt that a wall hanging does not encounter. Because of this, floorcloth paintings are prepared differently. The paint used must be durable enough to withstand the abrasion of foot traffic and flexible enough to be rolled and unrolled during shipping or moving. Liquitex Professional Grade Artist Colours with a unique resin system offers artists the most durable acrylic paint suitable for floorcloth application. Longevity is related to placement and the amount of foot traffic. Walking on the surface deposits dirt and damages the paint over time. Washing with abrasive cleaners will also damage the surface of the painting. Heavyweight #8 Cotton Duck or Tara Floor Cloth. Lightweight canvas is less durable. 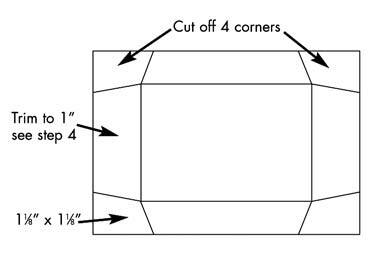 Canvas should be 4"- 6" larger in each direction (horizontal and vertical) than the planned finished dimensions. Washing the canvas insures minimum shrinkage and warping of finished floor cloth. Warping and buckling is exaggerated when the edges are later turned under. Wash canvas in a standard washing machine with a small amount of detergent. Air-dry and iron out wrinkles. Brush on 1 coat of Liquitex Matte Medium to backside of canvas. Let Dry. Flip canvas over and repeat step 3. Staple canvas directly onto studio painting wall. Staple canvas onto 1 inch thick plywood that is larger than canvas. Mark dimensions of finished canvas dimensions on front of canvas. There should a 2-3 inch border on each side. Tape off finish canvas dimensions with masking tape, to make it easier to turn under and glue the side edges. Apply Liquitex Professional Grade Gesso (white or coloured) or mix gesso with Matte Medium (4 parts gesso - 1 part medium) for added flexibility. Let dry. Optional: Lightly sand the first coat of gesso or gesso/medium, then apply a second coat. Let dry. Liquitex Pouring Medium can be used for marbleizing techniques and to create seamless surface. Liquitex String Gel has a honey like consistency and used to create long flowing marks. Liquitex Glazing Medium offers unparalleled clarity and depth to the layering of transparent colour. Liquitex Iridescent Medium imparts a shimmering metallic quality when mixed with colours. After the floorcloth is complete and fully dry for 48 hours, Soluvar Final Protective Varnish should be applied to extend the life of the floorcloth by protecting it from pollution and dirt. This varnish is removable, to allow future removal of dirt and scuff marks. Floorcloth varnishing occurs in two steps: an isolation varnish and the final removable varnish. Refer to Liquitex Varnishes for application instructions. After Soluvar has completely dried in 1-2 weeks, remove the stapled floorcloth from the wall or plywood. Turn canvas over and gesso the entire back of the floorcloth. Let dry. Remove masking tape from border. Trim unpainted canvas edges ("hem") to approximately 1". 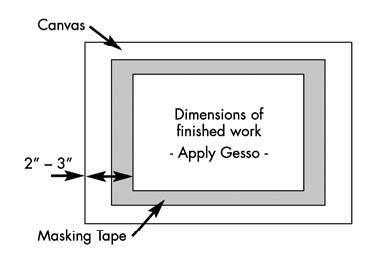 At each corner, measure 1 1/8" in both directions and cut the unpainted canvas edges to the exact corner point of the painted canvas. You are cutting away each corner. Fold over the four unpainted edges (2 vertical, 2 horizontal). Create a crease by pressing where the painted canvas ends and the unpainted canvas begins. Apply Matte Gel Medium to the back of each edge and press firmly. Put under even weight and let dry 24-48 hours. Do not lift weight off until completely dry. Apply Matte Medium to the outer surface of the edges to seal. Select a sturdy tube 8-12" in diameter. Lay painting face down and roll. Apply warm water or soap and water to surface with soft mop. Do not clean with ammonia or ammonia based products. When the surface gets dirty or scuffed, it can be restored by removing and recoating with Soluvar Varnish. Refer to Liquitex Varnishes for removal instructions.